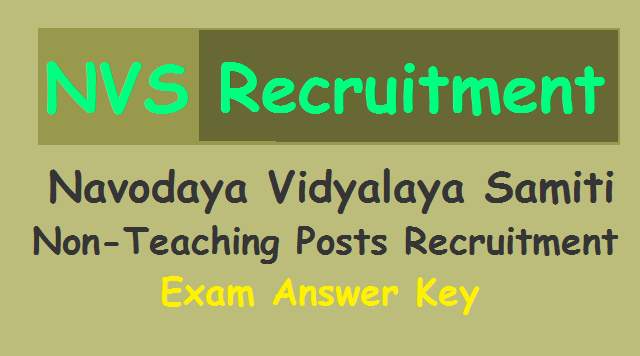 Navodaya Vidyalaya Samiti Answer Key for Non-Teaching Posts Recruitment Exam 2018 /NVS Non-Teaching Posts Recruitment Exam Answer Key / Notice for Inviting objection(s) in the Questions, Answers and Provisional Answer Keys of Computer Based Test/ Exam for recruitment to various non-teaching posts in NVS-2017: Navodaya Vidyalaya Samiti (NVS) has released answer keys for the exam held for recruiting for non-teaching posts. Candidates who had appeared for the examination from 12 to 14 January 2018 can now check the answer key online. Candidates can also raise objections to the answer key. The examination was computer based test. Candidates can raise objections online from 18 till 22 January 2018. The answer keys can be accessed using respective ID and password. Details in this regard are available at nvshq.org. ‘If candidates do not submit their objections within stipulated period, such candidates will not have any right for future legal claim in any court of law for re-evaluation at later stage of selection process,’ reads the official update. COMMENTSNVS had conducted the recruitment process in November 2017. The exam was held to select candidates for non-teaching posts.